Sturdy and attractive tables will never go out of style. 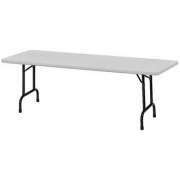 With quality folding tables and training tables from Correll, your conferences, special events and meetings are sure to run smoothly. You can count on Correll for a quality table that&apos;s made in the USA. Hertz Furniture is proud to offer you our exclusive extended 25-year warranty on this wide selection of top-tier tables. With Correll furniture, you can be sure that your conference room, classroom or social hall will be properly furnished for many years to come. 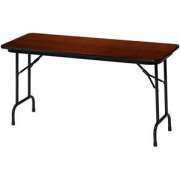 Folding tables can come in handy just about anywhere. They can be used in a classroom, social hall, computer lab, expo and lots of other places. Many surface materials are available, but blow-molded thermoplastic is the best option by far. 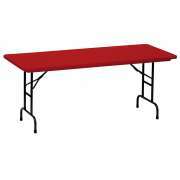 Plastic folding tables are virtually indestructible. Even permanent marker and paint can be removed from them with very little effort. 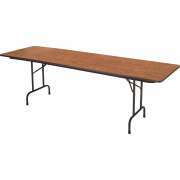 Foldable tables are also available with laminate or Duralam surfaces. Sturdy Duralam will not scratch, peel or show watermarks even after extended use. There are also various shapes to choose from. 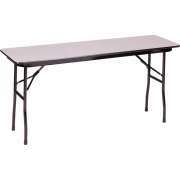 Rectangular folding tables are a favorite because they can be used for a variety of purposes. 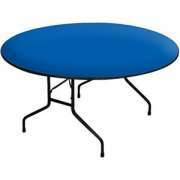 If the main purpose of your folding tables is for celebrations and events, round folding tables are an excellent option. A circle creates a more friendly feel that is conducive to meals and social gatherings. With a nice table cloth and some elegant chairs, your folding table will transform into a stately banquet table in a matter of seconds. Foldable tables from Correll are available with a convenient adjustable height. They can be adapted to fit various purposes and chair styles. If you want to add an exciting twist, consider a colored surface. Counter-height tables can be used as work benches as well. 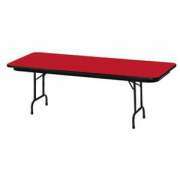 Every business and school needs a place to hold meetings. Having a professional-style conference table will set the tone in a boardroom. Sleek, high-pressure laminate conference room tables in a selection of attractive wood hues will fit in with any decor. Their dramatic x-shaped bases leave plenty of open legroom and provide excellent support to the tabletop. Whether you are hosting a teacher inservice day or an orientation for new recruits, having the right training tables will make sessions more pleasant and productive for everyone involved. Correll has appealing seminar tables in a huge selection of both vibrant and muted tones. To give more workspace to employees or participants, consider a semi-circular work surface. Most companies don&apos;t host training sessions on a daily basis, so it is important to make sure that seminar tables can be stored efficiently. Flip-top tables are ideal because they can be nested compactly in a storage closet. Casters are another helpful design feature because they minimize lifting and back strain when tables are being moved. 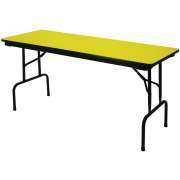 For companies that have designated training areas that are not often rearranged, training tables with fixed legs are available as well. Looking for some new classroom furniture? Activity tables will make the perfect addition to your preschool or elementary school. With round and rectangular surfaces and an adjustable height, you can make sure that children of all ages enjoy the benefits of appropriately-sized school tables. Rather than having to order classroom tables with different heights for each grade, and making sure that chair heights correspond, you can easily create the perfect fit in a matter of minutes. With so many tables around, anyone can spend a lot of time hauling furniture into place and arranging rooms. Table carts make things easier on event committees, volunteers and maintenance workers. Rather than having to carry each folding table individually from one rom to another or into the storage closet, multiple tables can simply be loaded onto the table dolly and rolled to their destination. Correll tables will provide great work surfaces for your school or business. 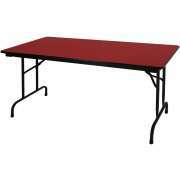 With appropriate activity tables, seminar tables and folding tables, it is easier to be productive and focus on the task at hand, whatever it may be. If you need assistance while selecting the size, quantity or color of your tables, the Hertz Design Center is here for you, offering free project planning advice whenever you need it.